Well with Christmas coming up I'm having plenty of commissions thrown at me, which is great! Some people just can't find what they're looking for and I love trying to help, although I always get a bit nervous as to whether I have created something they really like! 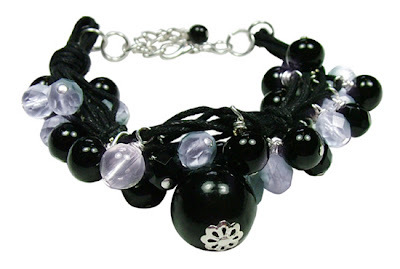 Here is my latest project, a purple and black beaded bracelet to match a necklace that my customer was desperate to have a 'set' for. This time I've used black cord as my base and wrapped around lots of beads! I like the finished result and think I shall be adapting this style in the future! Yesterday I went into town for the first time since I left my job at Burtons and it felt really strange going back, but I was secretly very pleased not to have to be at work but able to shop instead! I picked up a beautiful new scarf and coat and did a spot of lunch! Oh I love having weekends off! Exactly Jo! Well when I sowed this bracelet to Mark, my boyfriend he genuinely thought it was the original necklace! Which is a good sign! Thank you! Sh was really chuffed with the result! Thank goodness!